Comments: The most outstanding ornamental characteristic of 'October Glory' is bright red to orange fall color (sometimes on the same tree) lasting several weeks. It puts on one of the most brilliant displays of any tree late in the fall. 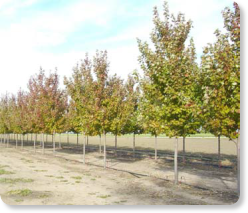 Best suited to wide lawns (>6 feet wide); medium-sized tree lawns (4-6 feet wide); Recommended for buffer strips around parking lots or for median strip plantings in the highway; near a deck or patio; reclamation plant; screen.